The Chinese have harvested and eaten kiwifruit, known to them as “yang tao,” since ancient times, according to “The Encyclopedia of Healing Foods.” Missionaries carried the fruit to New Zealand in the early 20th century, where they became known as Chinese gooseberries. Within a few decades, their commercial cultivation on the island flourished. Chinese gooseberries became “kiwifruit” when they reached the United States in 1961, in honor of a small, brown fuzzy bird native to New Zealand. The average kiwifruit, sometimes known for short as a "kiwi," is roughly the size of an extra-large chicken’s egg and is one of the most nutrient-dense fruits available. Most foods contain some amount of naturally-occurring acid that causes them to have acidic pH values. Pure water is neutral and has an arbitrarily assigned pH value of 7.0. Food with a pH value of 6.9 or lower is acidic, while food that has a pH of 7.1 or higher is basic, or alkaline. Kiwifruit mainly contains quinic, citric and malic acids. Depending on its state of ripeness, the pH value of a kiwifruit varies between 3.1 and 3.96, classifying it as a “high-acid” food. By comparison, grapefruit has a similar acid profile, lemons and limes are more acidic and mangoes are slightly less acidic. The pH value of a food does not determine whether or not it’s acidifying or alkalizing in the body. The metabolic process effects the pH nature of all foods, either by shifting it slightly or altering it completely. For example, the pH value of eggs is slightly alkaline. In the body, however, eggs are slightly to moderately acid-forming. Likewise, kiwifruit is considered a high-acid food, but it is highly alkaline-forming in the body. Along with limes, lemons, all varieties of melons, raisins, figs, papaya, mangoes and avocados, kiwifruit is one of the top most alkalizing fruits. In addition to being highly alkaline-forming, kiwifruit is low in calories and packed with nutrients. A 3.5-oz. serving of kiwifruit — about one large kiwi or 1 1/3 medium-sized kiwis — contains 61 calories, 1.1 g of protein, 0.5 g of fat, 3 g of dietary fiber and 14.7 g of carbohydrate, of which 9 g are the natural sugars fructose and glucose. Kiwifruit is a rich source of antioxidants and enzymes. One serving provides over two times the daily recommended allowance of the antioxidant vitamin C, which promotes respiratory tract health and boosts the immune system. 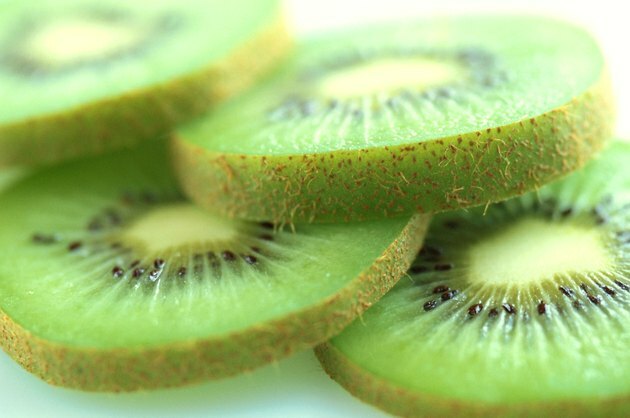 It's also a good source of dietary fiber, potassium, magnesium and vitamins A and E.
As with all fruit, kiwifruit is more highly alkalizing in the body when it's fully ripe, but before it begins to spoil. Placing an unripe kiwifruit in a paper bag with an apple or a banana away from direct sunlight will speed along the ripening process. Heating or cooking kiwifruit not only destroys valuable enzymes and reduces the potency of other nutrients, it also slightly reduces the fruit’s alkalizing effect in the body. Choose organic kiwifruit whenever possible, as the use of pesticides also reduces the alkaline-forming nature of all fruits and vegetables.